Today I did three Pomodoro’s! What does that mean? I’m not entirely sure, actually. I’m quite sure that’s something I just made up a moment ago. Though, “Pomodoro” is a real thing; a time management system. I’m just not entirely sure if I’m doing it right at this moment in time. This is my first day using this technique after all. So, the easiest way to explain what this Pomodoro thing is is to imagine that you set yourself a time limit for getting work done. The app I downloaded to my tablet (not the official Pomodoro app, but a free third party version) sets a timer for 25 minutes. I focus on doing my work for the full 25 minutes with zero distractions allowed. Then an alarm goes off and I get a 5 minute break. In today’s case I played some hockey on my Playstation for 5 minutes. Then I proceeded to do another 25 minutes of work. After that was finished, I went for a walk to the grocery store. When I came home I cooked something to eat, finished the hockey game that I had paused from earlier, and then did another 25 minutes of work. So I ended up putting in a solid 75 minutes of work into this picture today before writing this blog post. Not bad for my first day, I have to say. This system actually worked really well for me because I don’t have a comfortable place to do my artwork yet. So working on my computer with my drawing tablet – while sitting in my living room chair for hours on end – can hurt my back and my wrist. Working for just 25 minutes before getting up and moving around felt really good. Though it’s a little annoying to have to try and get situated once again when it’s time to get back to work. So that’s something I’m going to have to figure out, or get used to. Alright, so what’s new with today’s picture you ask? Well, the planet in the background there has some city lights now. I zoomed in real close and made a couple layers of varying brightness to simulate some city lights. 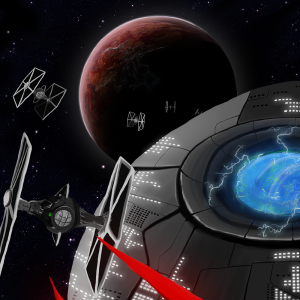 Besides a whole bunch of various tiny details in the ships and the background star clusters, I added more windows and details to the Death Star. Oh! And as per a comment from yesterday’s post, I added some green to the plasma looking stuff. Doing all these teeny tiny details is the main reason I wanted to find a time management system to help me get through it. It’s always daunting when you have to prepare to spend many hours working on individual details that – once finished – raise the overall quality of the entire drawing. This Pomodoro technique seems to be doing the trick. I’m not sure if it’s something I’ll really use in the future, but for right now at least, it’s helping out immensely.